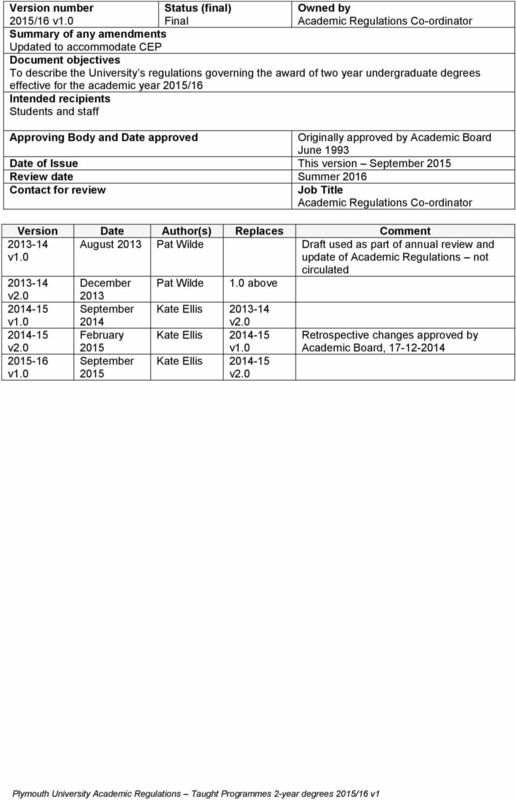 Download "Regulatory Framework for Undergraduate Awards: Two Year Degrees (Amendments since 2014/15 shown in bold and underlined)"
1 These regulations apply to students at Plymouth University sites of delivery and in all UK and international partnerships, unless exceptions to regulations have been formally approved. 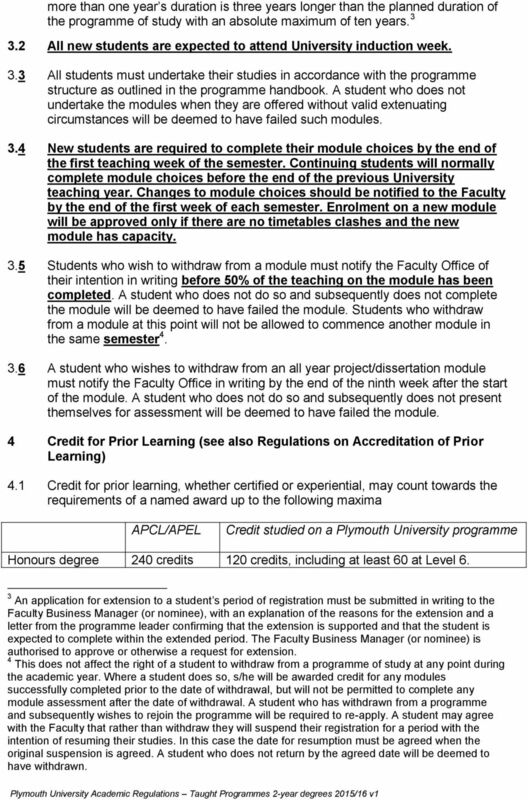 Plymouth University Regulatory Framework for Undergraduate Awards: Two Year Degrees (Amendments since 2014/15 shown in bold and underlined) 1 Introduction These Regulations apply only to the two year accelerated degree and the following University of Plymouth undergraduate awards Certificate of Higher Education CertHE Diploma of Higher Education DipHE Bachelor of Arts BA Bachelor of Science BSc 2 Programme/scheme structure 2.1 Academic study will be organised into modules, specified in terms of credits. Module sizes may vary from 20 to 60 credits. Modules of 10 credits (normally delivered within one term) must be justified within the approval documentation and discussed and agreed at the approval event Individual modules will each have a shelf life beyond which the module ceases to be valid for credit transfer or towards an award. 2.3 The Level of a module is determined by the standard of work required to achieve the objectives of the module (see information on level descriptors). 2.4 The credit weighting of undergraduate awards will be Certificate of Higher Education 120 credits at Level 4 or above Diploma of Higher Education 240 credits, of which at least 120 are at Level 5 or above Ordinary Degree 320 credits of which 80 are at Level 6 2 Honours Degree and a further 120 at Level 5 or above 360 credits of which at least 120 are at Level 6, and a further 120 at Level 5 or above 2.5 The title(s) of the award(s) available within an undergraduate programme are specified in the appropriate programme definitive document. 3 Student registration/withdrawal 3.1 All students must register at the beginning of their programme of study and subsequently as required. The maximum period of registration for programmes of 1 Any other variations, other than modules included within the CPD Framework and co-curricular modules (e.g. Learning Through Volunteering/Student Ambassador Modules, currently 5 credits at Level 4) would require exceptional approval by Academic Regulations Sub-Committee. 2 A student registered for an Ordinary Degree may not take more than 80 credits at Level 6. 2 more than one year s duration is three years longer than the planned duration of the programme of study with an absolute maximum of ten years All new students are expected to attend University induction week. 3.3 All students must undertake their studies in accordance with the programme structure as outlined in the programme handbook. A student who does not undertake the modules when they are offered without valid extenuating circumstances will be deemed to have failed such modules. 3.4 New students are required to complete their module choices by the end of the first teaching week of the semester. Continuing students will normally complete module choices before the end of the previous University teaching year. Changes to module choices should be notified to the Faculty by the end of the first week of each semester. Enrolment on a new module will be approved only if there are no timetables clashes and the new module has capacity. 3.5 Students who wish to withdraw from a module must notify the Faculty Office of their intention in writing before 50% of the teaching on the module has been completed. A student who does not do so and subsequently does not complete the module will be deemed to have failed the module. Students who withdraw from a module at this point will not be allowed to commence another module in the same semester A student who wishes to withdraw from an all year project/dissertation module must notify the Faculty Office in writing by the end of the ninth week after the start of the module. A student who does not do so and subsequently does not present themselves for assessment will be deemed to have failed the module. 4 Credit for Prior Learning (see also Regulations on Accreditation of Prior Learning) 4.1 Credit for prior learning, whether certified or experiential, may count towards the requirements of a named award up to the following maxima APCL/APEL Credit studied on a Plymouth University programme Honours degree 240 credits 120 credits, including at least 60 at Level 6. 3 An application for extension to a student s period of registration must be submitted in writing to the Faculty Business Manager (or nominee), with an explanation of the reasons for the extension and a letter from the programme leader confirming that the extension is supported and that the student is expected to complete within the extended period. The Faculty Business Manager (or nominee) is authorised to approve or otherwise a request for extension. 4 This does not affect the right of a student to withdraw from a programme of study at any point during the academic year. Where a student does so, s/he will be awarded credit for any modules successfully completed prior to the date of withdrawal, but will not be permitted to complete any module assessment after the date of withdrawal. A student who has withdrawn from a programme and subsequently wishes to rejoin the programme will be required to re-apply. A student may agree with the Faculty that rather than withdraw they will suspend their registration for a period with the intention of resuming their studies. In this case the date for resumption must be agreed when the original suspension is agreed. A student who does not return by the agreed date will be deemed to have withdrawn. 3 Degree 220 credits 100 credits, including at least 60 at Level 6. DipHE 160 credits 80 credits, including at least 60 at Level 5 or above. CertHE 60 credits 60 credits at Level 4 or above In all cases the learning for which credit is awarded must constitute a coherent programme of study when considered with the University credits to be studied. Accreditation of prior learning is based on the concept of specific credit (that is that the learning outcomes of the prior learning are directly equivalent to those of the modules from which the student will be exempt as a result). 4.3 Where it is agreed that certificated prior learning to which marks are attached may contribute towards a final award, a decision must be taken at the same time as to whether the marks, in their original or an amended form, will be included in the student record. 4.4 Individual programmes/schemes will determine the nature of the processes adopted for accreditation of prior learning (certificated and/or experiential). (See separate Regulations on Accreditation of Prior Certificated Learning [APCL] and Assessment of Prior Experiential Learning [APEL].). 5 Assessment 5.1 The purposes of assessment are: to objectively measure a student s achievements against the learning outcomes of the module to assist student learning by providing appropriate feedback on performance to provide a reliable and consistent basis for the recommendation of an appropriate award 5.2 The assessment for each module will be detailed in the Module Record (the student programme handbook for the award(s) will identify where students may access the Module Record). This will specify the elements contributing to summative assessment 6 and will state the weightings of each element within the overall module mark. 5.3 Tests, practical assessments, OSCEs and coursework assessment will be set during the module. Formal examinations, where part of a module assessment, will be scheduled after the end of the University s standard teaching year or as appropriate to the particular programme 7. 5 These maxima may be waived in the case of a student who has successfully passed a Degree and wishes to convert it to an Honours Degree. A student who has completed a Degree at the University of Plymouth may be awarded up to 320 APCL credits towards the Honours Degree. A student who has completed a Degree at another institution may be awarded up to 300 APCL credits towards the Honours Degree subject to studying 60 Level 6 credits at the University of Plymouth. 6 A full list of the various elements, together with definitions, is included elsewhere in the Academic Regulations. Tests must be organised within the Faculty/ School and be held within the normal teaching slot for the module and will take place in the room in which the teaching is normally timetabled. 7 Modules taught between September and December will not normally have formal examinations in the following May. Where examinations are approved for this period, staff will ensure that appropriate arrangements are in place to support student revision. 4 5.4 Students will be assessed according to the assessment specified for each module on which they are registered, irrespective of their programme of study. 6 Successful completion of a module 6.1 The pass mark for an undergraduate module (Levels 0 and 4-6) is 40%. 6.2 Where module assessment involves more than one element of assessment, a student is also required to achieve a minimum of 30% in each element 8. A module may be validated with the requirement that a student achieve a mark of over 30% in any or all elements A student who fails the immersive module in the first semester, and is required to take a referral, is required to refer only those components which s/he failed. A student who fails any other module and is required to take a referral will normally be required to refer only the element(s) of the module which s/he failed. A student who fails and is required to repeat a module will normally be required to repeat all elements Successful completion of Level 4 and Level An Award Assessment Board will normally meet as appropriate to consider Level and interim progression and to make decisions on referrals. The Faculties will make local arrangements to review the provisional marks of the immersive module in order to identify those students requiring an in-year referral. 7.2 A student must pass the requisite number of credits included in the programme specification to complete a Level. 7.3 A student who has failed up to 40 credits of a Level and has a resit opportunity will normally be permitted to continue on to the next Level, i.e. Level 4 to Level 5 or Level 5 to Level 6, and to take the resit(s) at the next available opportunity If a student studies more than the number of credits required in the Level, the Award Assessment Board will consider the marks of the best credits falling within the programme specification and up to the number required for completion of the Level (subject to any core/prerequisite requirements) in considering decisions on progression. 7.5 Modules which have been successfully completed cannot be reassessed. 8 Award of the Certificate of Higher Education 8.1 A Certificate of Higher Education may be awarded to: 8 An element is not necessarily one piece of work, but the weighted marks obtained for one type of assessment. 9 Normally, this will require a pass (40%) in the specified element(s) of assessment. Exceptions will be validated only where an accrediting professional body requires an alternative minimum achievement. 10 Except where there is for example a substantial laboratory/fieldwork component which has been completed to a good standard where timetabling problems may otherwise occur. In such cases the Award Assessment Board will specify what is to be retaken. 11 See also regulation 10.3. 5 8.1.1 a student who is registered for the award of a Certificate of Higher Education and has successfully completed 120 credits at Level 4 or above; or a student who has successfully completed 120 credits at Level 4 or above in an undergraduate programme on which s/he is not continuing, provided the credits successfully completed fall within the programme specification for the award. 8.2 If the aggregate of the student s best 120 credits falling within the programme specification (subject to any core or co-requisite requirements) is 70% or above, the CertHE will be awarded with Distinction. 9 Award of the Diploma of Higher Education 9.1 A Diploma of Higher Education may be awarded to: a student who is registered for the award of a Diploma of Higher Education and has successfully completed 240 credits, including at least 120 credits at Level 5 or above; or a student who has successfully completed 240 credits, including at least 120 credits at Level 5 or above, in a Degree or Honours Degree programme on which s/he is not continuing, provided that the credits passed fall within the programme specification. 9.2 If the aggregate of the best 120 credits at Level 5 or above falling within the programme specification (subject to any core/pre-requisite requirements) is 70% or above, the DipHE will be awarded with Distinction. 10 Procedure in the event of failure 10.1 A student who fails any component(s) of the immersive module in the first semester will be required to complete an in-year referral in the failed component(s) by the end of week 26. 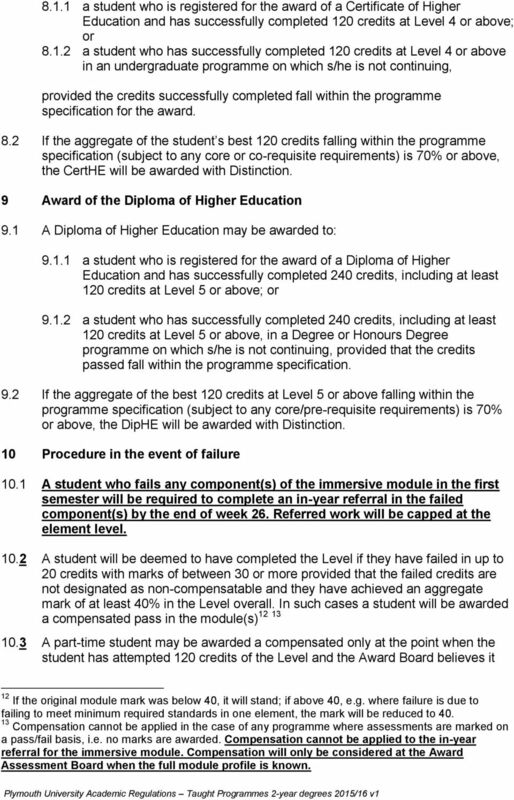 Referred work will be capped at the element level A student will be deemed to have completed the Level if they have failed in up to 20 credits with marks of between 30 or more provided that the failed credits are not designated as non-compensatable and they have achieved an aggregate mark of at least 40% in the Level overall. In such cases a student will be awarded a compensated pass in the module(s) 10.3 A part-time student may be awarded a compensated only at the point when the student has attempted 120 credits of the Level and the Award Board believes it 12 If the original module mark was below 40, it will stand; if above 40, e.g. where failure is due to failing to meet minimum required standards in one element, the mark will be reduced to Compensation cannot be applied in the case of any programme where assessments are marked on a pass/fail basis, i.e. no marks are awarded. Compensation cannot be applied to the in-year referral for the immersive module. 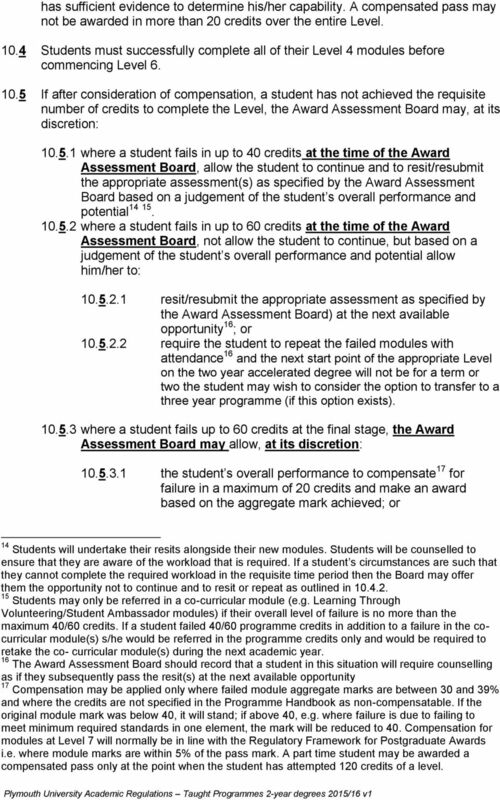 Compensation will only be considered at the Award Assessment Board when the full module profile is known. 6 has sufficient evidence to determine his/her capability. A compensated pass may not be awarded in more than 20 credits over the entire Level Students must successfully complete all of their Level 4 modules before commencing Level If after consideration of compensation, a student has not achieved the requisite number of credits to complete the Level, the Award Assessment Board may, at its discretion: where a student fails in up to 40 credits at the time of the Award Assessment Board, allow the student to continue and to resit/resubmit the appropriate assessment(s) as specified by the Award Assessment Board based on a judgement of the student s overall performance and potential where a student fails in up to 60 credits at the time of the Award Assessment Board, not allow the student to continue, but based on a judgement of the student s overall performance and potential allow him/her to: resit/resubmit the appropriate assessment as specified by the Award Assessment Board) at the next available opportunity 16 ; or require the student to repeat the failed modules with attendance 16 and the next start point of the appropriate Level on the two year accelerated degree will not be for a term or two the student may wish to consider the option to transfer to a three year programme (if this option exists) where a student fails up to 60 credits at the final stage, the Award Assessment Board may allow, at its discretion: the student s overall performance to compensate 17 for failure in a maximum of 20 credits and make an award based on the aggregate mark achieved; or 14 Students will undertake their resits alongside their new modules. Students will be counselled to ensure that they are aware of the workload that is required. If a student s circumstances are such that they cannot complete the required workload in the requisite time period then the Board may offer them the opportunity not to continue and to resit or repeat as outlined in Students may only be referred in a co-curricular module (e.g. Learning Through Volunteering/Student Ambassador modules) if their overall level of failure is no more than the maximum 40/60 credits. If a student failed 40/60 programme credits in addition to a failure in the cocurricular module(s) s/he would be referred in the programme credits only and would be required to retake the co- curricular module(s) during the next academic year. 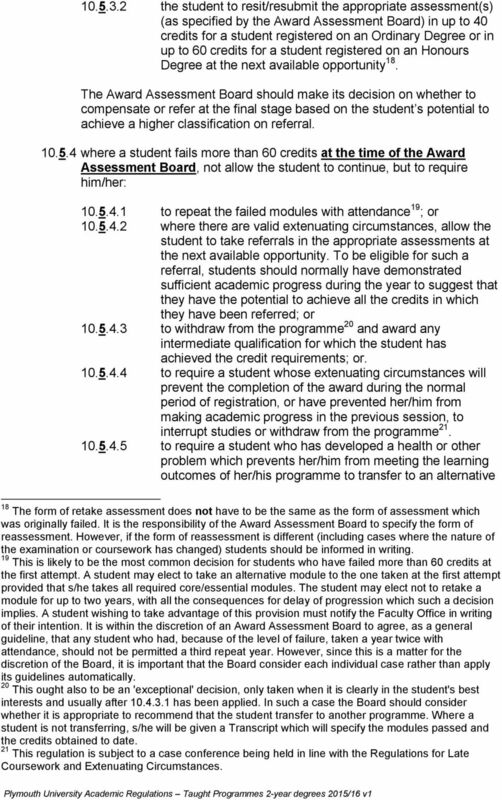 16 The Award Assessment Board should record that a student in this situation will require counselling as if they subsequently pass the resit(s) at the next available opportunity 17 Compensation may be applied only where failed module aggregate marks are between 30 and 39% and where the credits are not specified in the Programme Handbook as non-compensatable. If the original module mark was below 40, it will stand; if above 40, e.g. where failure is due to failing to meet minimum required standards in one element, the mark will be reduced to 40. 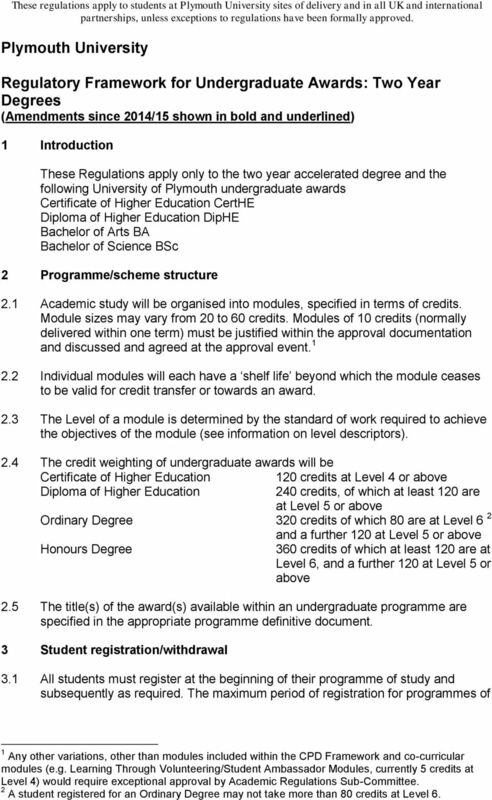 Compensation for modules at Level 7 will normally be in line with the Regulatory Framework for Postgraduate Awards i.e. where module marks are within 5% of the pass mark. A part time student may be awarded a compensated pass only at the point when the student has attempted 120 credits of a level. 7 the student to resit/resubmit the appropriate assessment(s) (as specified by the Award Assessment Board) in up to 40 credits for a student registered on an Ordinary Degree or in up to 60 credits for a student registered on an Honours Degree at the next available opportunity 18. The Award Assessment Board should make its decision on whether to compensate or refer at the final stage based on the student s potential to achieve a higher classification on referral where a student fails more than 60 credits at the time of the Award Assessment Board, not allow the student to continue, but to require him/her: to repeat the failed modules with attendance 19 ; or where there are valid extenuating circumstances, allow the student to take referrals in the appropriate assessments at the next available opportunity. To be eligible for such a referral, students should normally have demonstrated sufficient academic progress during the year to suggest that they have the potential to achieve all the credits in which they have been referred; or to withdraw from the programme 20 and award any intermediate qualification for which the student has achieved the credit requirements; or to require a student whose extenuating circumstances will prevent the completion of the award during the normal period of registration, or have prevented her/him from making academic progress in the previous session, to interrupt studies or withdraw from the programme to require a student who has developed a health or other problem which prevents her/him from meeting the learning outcomes of her/his programme to transfer to an alternative 18 The form of retake assessment does not have to be the same as the form of assessment which was originally failed. 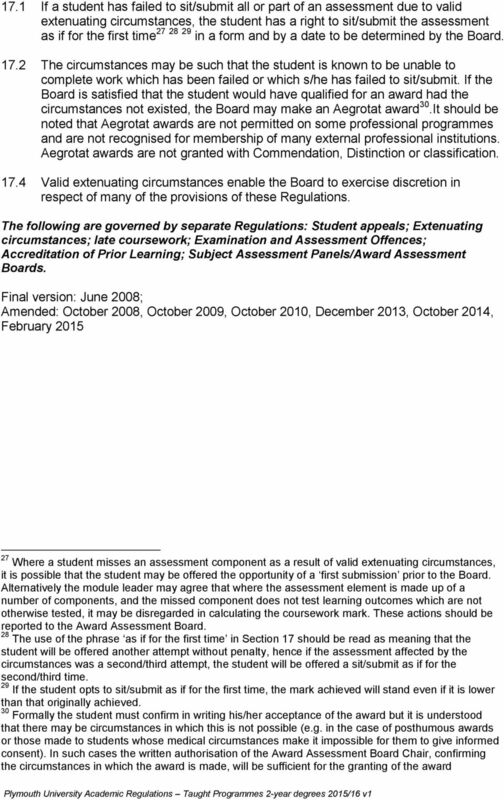 It is the responsibility of the Award Assessment Board to specify the form of reassessment. However, if the form of reassessment is different (including cases where the nature of the examination or coursework has changed) students should be informed in writing. 19 This is likely to be the most common decision for students who have failed more than 60 credits at the first attempt. A student may elect to take an alternative module to the one taken at the first attempt provided that s/he takes all required core/essential modules. The student may elect not to retake a module for up to two years, with all the consequences for delay of progression which such a decision implies. A student wishing to take advantage of this provision must notify the Faculty Office in writing of their intention. It is within the discretion of an Award Assessment Board to agree, as a general guideline, that any student who had, because of the level of failure, taken a year twice with attendance, should not be permitted a third repeat year. However, since this is a matter for the discretion of the Board, it is important that the Board consider each individual case rather than apply its guidelines automatically. 20 This ought also to be an 'exceptional' decision, only taken when it is clearly in the student's best interests and usually after has been applied. In such a case the Board should consider whether it is appropriate to recommend that the student transfer to another programme. Where a student is not transferring, s/he will be given a Transcript which will specify the modules passed and the credits obtained to date. 21 This regulation is subject to a case conference being held in line with the Regulations for Late Coursework and Extenuating Circumstances. 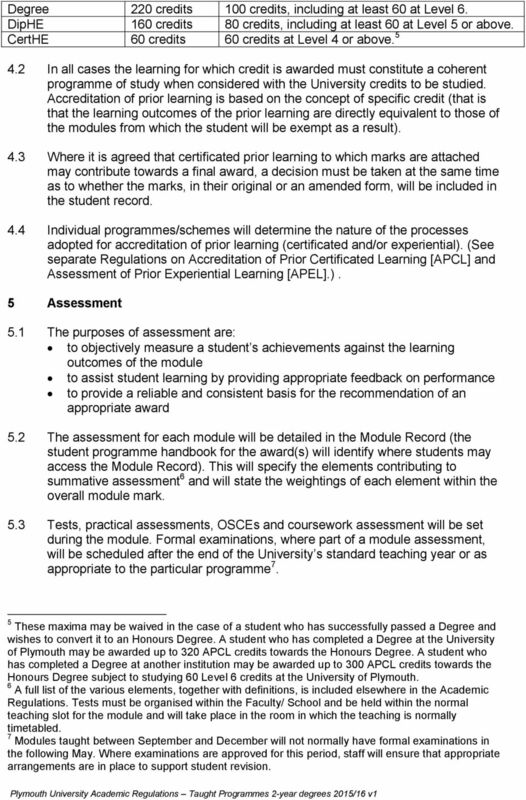 8 programme or withdraw from the programme and be granted the appropriate exit or aegrotat award For resit assessments, the original regulation for passing the module will apply for any student, unless the Award Assessment Board has specified a single module assessment in substitution for both elements, in which case the student must achieve 40% in that assessment A student will normally be permitted a maximum of three attempts at a module. A failed module may therefore not normally be referred or repeated on more than two occasions. If a student chooses to study a different module instead of the failed module the number of attempts at the original module will count towards the maximum number of attempts at the new module Where a failed module is successfully passed after referral or repeat, any element retaken will be capped at 40%. In the case of repeated modules this would normally apply to all elements. If a student chooses to study a different module instead of the failed module, the capping at 40% will still apply. 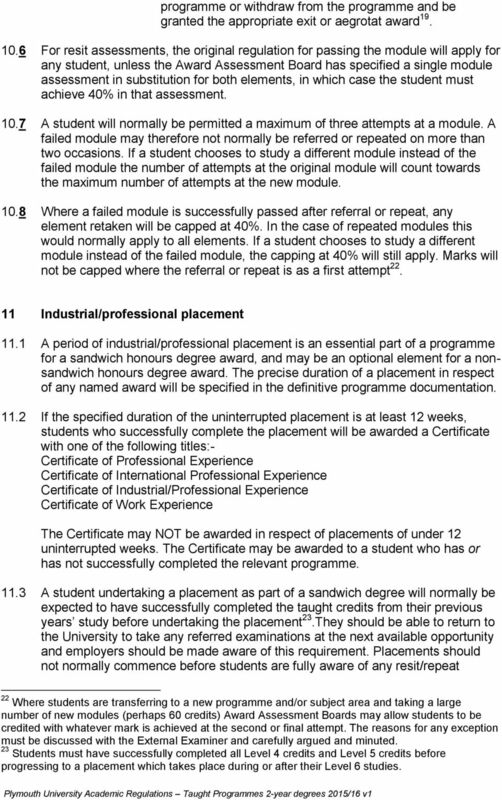 Marks will not be capped where the referral or repeat is as a first attempt Industrial/professional placement 11.1 A period of industrial/professional placement is an essential part of a programme for a sandwich honours degree award, and may be an optional element for a nonsandwich honours degree award. The precise duration of a placement in respect of any named award will be specified in the definitive programme documentation If the specified duration of the uninterrupted placement is at least 12 weeks, students who successfully complete the placement will be awarded a Certificate with one of the following titles:- Certificate of Professional Experience Certificate of International Professional Experience Certificate of Industrial/Professional Experience Certificate of Work Experience The Certificate may NOT be awarded in respect of placements of under 12 uninterrupted weeks. The Certificate may be awarded to a student who has or has not successfully completed the relevant programme A student undertaking a placement as part of a sandwich degree will normally be expected to have successfully completed the taught credits from their previous years study before undertaking the placement 23.They should be able to return to the University to take any referred examinations at the next available opportunity and employers should be made aware of this requirement. Placements should not normally commence before students are fully aware of any resit/repeat 22 Where students are transferring to a new programme and/or subject area and taking a large number of new modules (perhaps 60 credits) Award Assessment Boards may allow students to be credited with whatever mark is achieved at the second or final attempt. The reasons for any exception must be discussed with the External Examiner and carefully argued and minuted. 23 Students must have successfully completed all Level 4 credits and Level 5 credits before progressing to a placement which takes place during or after their Level 6 studies. 9 requirements. This would give students the opportunity to carefully consider whether or not to withdraw from a placement if they are required to resit/repeat modules A student who has passed all modules but who has nevertheless expressed an intention to opt to resit modules in up to 40 credits which were affected by valid extenuating circumstances could meanwhile proceed to placement. 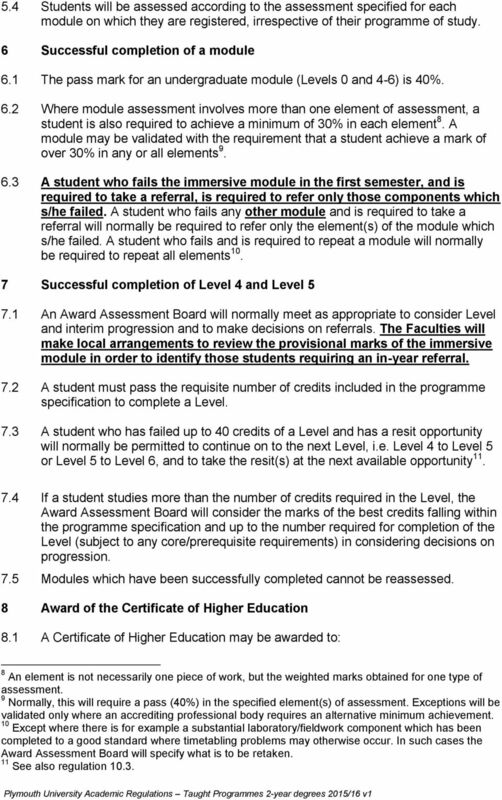 The student would be essentially repeating without attendance and could retake any or all elements of the module, but should be warned that retaking modules contained an element of risk and be given a deadline for confirming their intention to retake The method of assessment of the student's performance on placement must be specified in the definitive document for the appropriate named award. The placement may be a prerequisite for entry into the subsequent Level but it is not assigned any formal credits Where the placement is an essential part of the programme, students who do not successfully complete the placement may be required by the Award Assessment Board to: repeat the placement with another employer, or, transfer to a non-sandwich honours degree course, if available, or, withdraw from the programme. 12 Study abroad 12.1 Where a programme requires students to study for a period in a credit awarding institution overseas, credits will be awarded for successful completion of relevant courses approved by the programme team. The definitive award document will specify the number and level of credits to be awarded, the means by which successful completion is to be determined, any contribution of the credits to the award, and any conversion factors applied to the grades/marks If a period of study abroad is optional, the student and programme leader must agree in advance and in writing the extent (if any) to which credits awarded are to contribute to the final award, and any conversion factors to be applied to grades/marks. It is the student s responsibility to obtain any certification from the institution concerned. 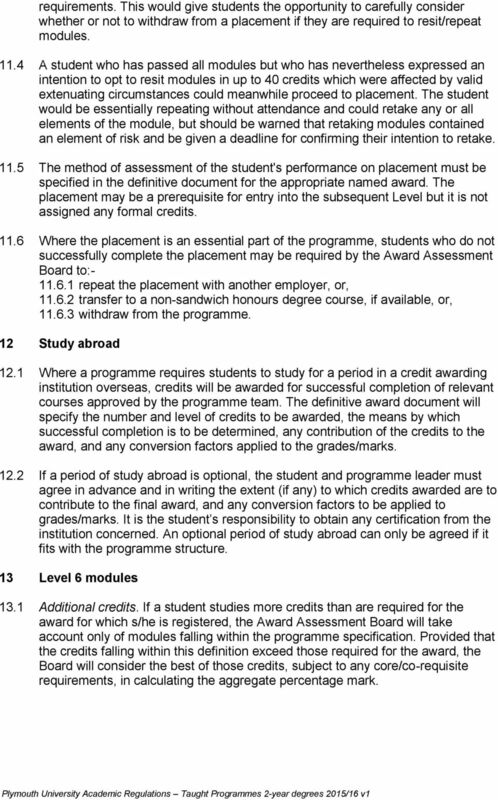 An optional period of study abroad can only be agreed if it fits with the programme structure. 13 Level 6 modules 13.1 Additional credits. If a student studies more credits than are required for the award for which s/he is registered, the Award Assessment Board will take account only of modules falling within the programme specification. Provided that the credits falling within this definition exceed those required for the award, the Board will consider the best of those credits, subject to any core/co-requisite requirements, in calculating the aggregate percentage mark. 11 The Level 4 aggregate mark is calculated using the highest module marks totalling 80 credits. Where modules are arranged in such a way that the 80 credits of highest module marks cannot be identified unequivocally, the level 4 aggregate mark calculation should take into account as close to 80 credits as possible, depending on the module structure. If the student s aggregate percentage mark falls within the boundaries of the classifications defined below, s/he is entitled to that award. 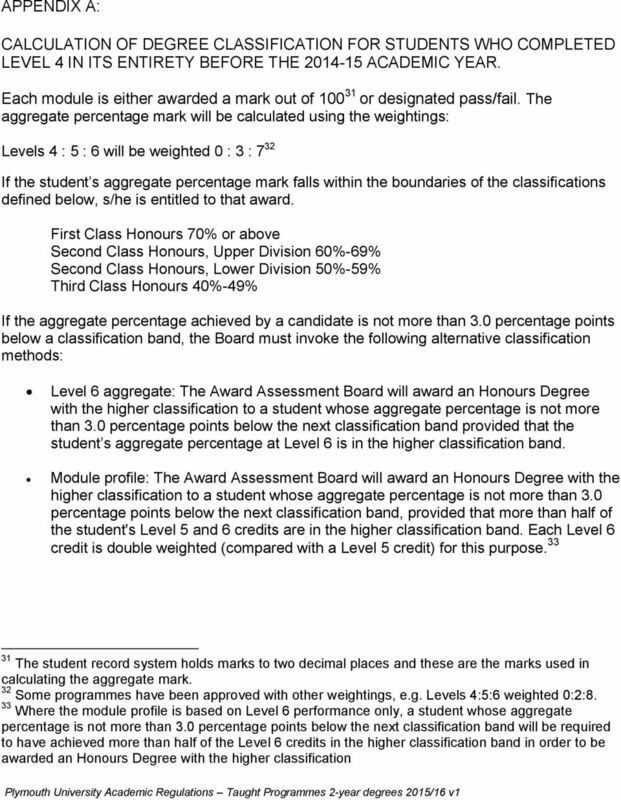 First Class Honours 70% or above Second Class Honours, Upper Division 60%-69% Second Class Honours, Lower Division 50%-59% Third Class Honours 40%-49% 15.3 If the aggregate percentage achieved by a candidate is not more than 3.0 percentage points below a classification band, the Board must invoke the following alternative classification methods Level 6 aggregate: The Award Assessment Board will award an Honours Degree with the higher classification to a student whose aggregate percentage is not more than 3.0 percentage points below the next classification band provided that the student s aggregate percentage at Level 6 is in the higher classification band Module profile: The Award Assessment Board will award an Honours Degree with the higher classification to a student whose aggregate percentage is not more than 3.0 percentage points below the next classification band, provided that more than half of the student's Level 5 and 6 credits are in the higher classification band. 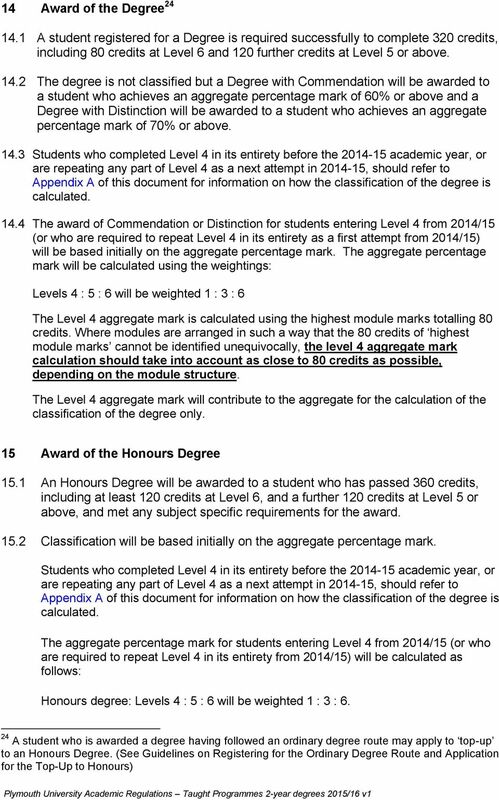 Each Level 6 credit is double weighted (compared with a Level 5 credit) for this purpose The Level 4 aggregate mark will contribute to the aggregate for the calculation of the classification of the degree only. It will not contribute to the module profile 15.5 Where a student has gained credits from another approved institution of higher education, in the UK or overseas, or through other APEL routes, the degree calculation will follow the agreement made at the time at which those credits were accepted. This will be either to award actual marks from such credits, or to assign credit without marks. Where marks are permitted on entry, they will be used to calculate the final aggregate percentage in the proportions shown in these regulations. Where marks are not permitted on entry, then the proportion of the degree calculation assigned to the level of study for which marks are absent will be assigned to the next highest level of study. 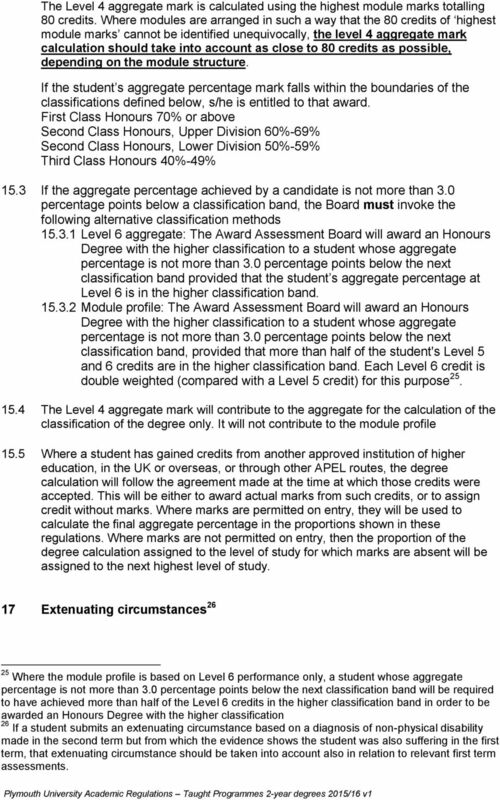 17 Extenuating circumstances Where the module profile is based on Level 6 performance only, a student whose aggregate percentage is not more than 3.0 percentage points below the next classification band will be required to have achieved more than half of the Level 6 credits in the higher classification band in order to be awarded an Honours Degree with the higher classification 26 If a student submits an extenuating circumstance based on a diagnosis of non-physical disability made in the second term but from which the evidence shows the student was also suffering in the first term, that extenuating circumstance should be taken into account also in relation to relevant first term assessments.